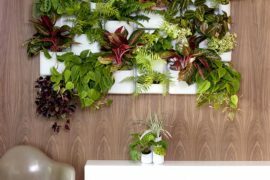 Summer may be coming to an end in many parts of the world but that doesn’t mean you can’t extend the season a bit by transforming one of your walls into an indoor oasis. 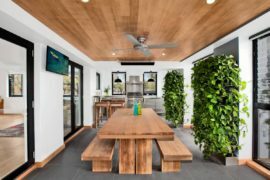 Nowadays, it’s easier than ever to create your own vertical garden with modular planting systems and hanging planters that require minimal assembly. 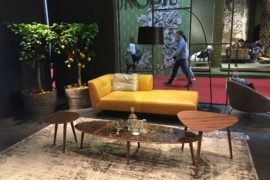 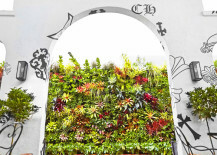 Whether you’re hoping to add a splash of color to your living room with a wall of blooms or harvest your own fresh herbs off of a garden right in your kitchen, read on for some of our favorite living wall units. 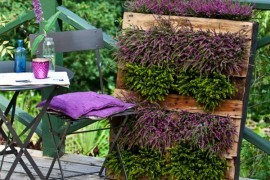 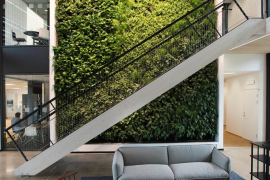 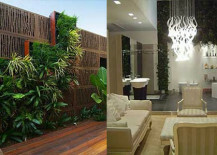 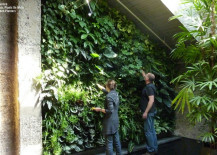 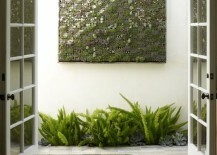 For a truly impactful living wall that is much easier to maintain than it looks, give a try. 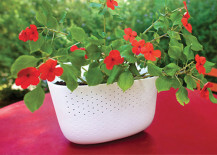 Using a modular system made from 100% recycled PET plastic felt, these versatile planters can be daisy-chained to create flourishing vegetative displays that can be as large or as small as you desire. 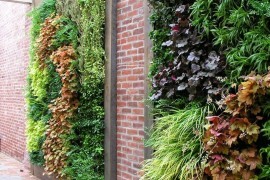 If you’re ready to take your vertical gardening to the next level, the allows for maximum creativity in the design of your green wall. 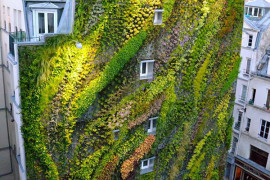 As an added bonus, your flourishing wall will serve as a thermal insulator that will keep your room cooler in the summer and warmer in the winter. 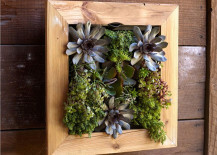 Finding our picks above a bit too elementary for your bright green thumb? 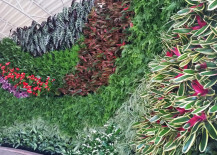 Check out this list of DIY green wall projects, rounded up by our very own Sherry Nothingam, for some more challenging ideas. 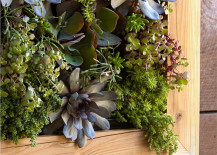 If you’re looking to start out with a simple spot of greenery on your wall, this from Bambeco features a modular system made out of recycled plastic that will make planting easy-to-care-for plants like succulents a breeze. 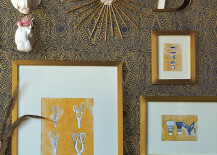 The rustic frame is also made out of reclaimed wood, and once you have the hang of one frame, you can add on others for an even more dramatic look. 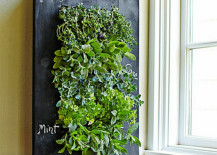 The combines two things we love–chalkboards and greenery–into one verdant package! 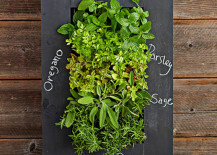 A removable reservoir and water collection tray makes watering a snap, and the blackboard finish makes it so easy to keep track of which plants are where. 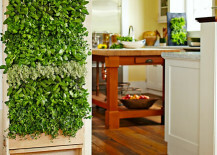 Turn your kitchen into a miniature farm with this gorgeous from Williams-Sonoma. 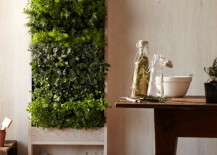 Made of FSC-certified Michigan maple and HDPE recycled with 26% jute and coconut fiber, the easy-to-use framework features space for 40 different plants so that you can pick your herbs right off of the wall before dinner. 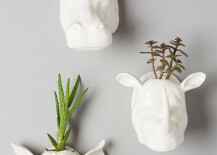 If you’re adding a touch of flora to your wall, why not mix in a bit of fauna too? 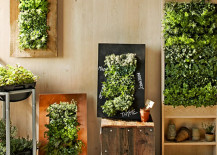 These from Anthropologie are a delightful way to turn your favorite plants into a vertical display. 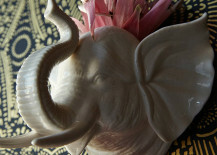 Choose from a hippo, a rhino or an elephant, or pick a few of each! 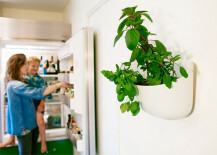 For the ultimate in indoor/outdoor living, Woolly Pocket’s allows you to grow plants or herbs inside and then easily transport them outside for meals, or vice versa. 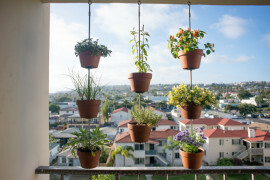 The handy planters are made in California from 100% post-consumer recycled milk jugs and can stand on their own, making them perfect for placing on your dinner table as decor or for guests to pick their own seasonings! 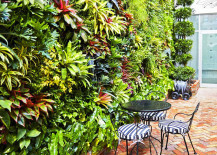 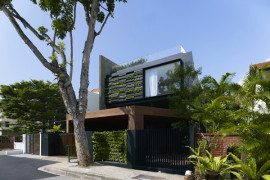 Which of these vertical gardens is on the horizon for you?